After the gym on Sunday morning, I went to the Cheesecake Factory for lunch with my parents and some friends who were visiting from out of town. After lunch I went to Go Sports to get a yoga strap – and I also ended up picking up a new zip-up top from Nike and a t-shirt from Under Armour. Mum wanted to go to Kinokuniya (honestly, it wasn’t my idea) to look around (and I ended up buying a book). On Monday I had my piano lesson in the afternoon and finished recording a piece called ‘Elements’ by Ludovico Einaudi. I also had my Arabic class that evening. On Tuesday I went to the gym and then took my parents to Jean-Georges at the Four Seasons. It was my mum’s birthday and neither of them had been there. The weather was lovely so we had a table outside, in the shade. 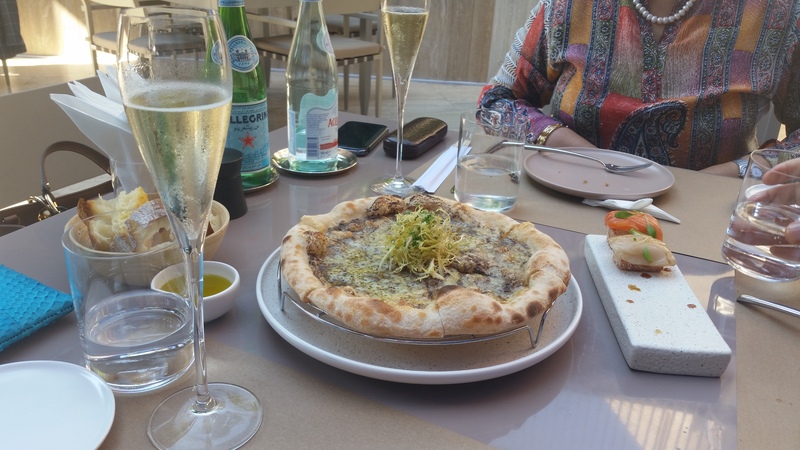 We each ordered a glass of Prosecco and shared a few starters: truffle pizza, hamachi, crispy sushi, warm prawn salad. We ordered our own main courses: I had the ‘simply prepared’ grilled sea bass, my mum had the lamb chops and my dad had the roast sea bass. For dessert I ordered the cheesecake for all of us to share, but they also brought out a little chocolate mousse cake with a candle for my mum (I’d called the day before to see if they could organise something). After lunch we went to the Virgin Megastore at the Dubai Mall as Dad wanted to get a new printer. I ended up getting some new headphones (Yurbuds) for my iPod, for the gym. That evening Mum and I went to see Sisters at Mercato (Dad went to play poker) – it was a funny movie if you’re in the mood for a chick flick. We had planned to grab a bite at Mercato after the movie but we were still so full from lunch so we came home and had some soup instead. I had a session with Pete on Wednesday morning and my Arabic class in the evening. On Friday afternoon, I went to Spa Zen for a massage with my friend who had celebrated her birthday the night before. Our massages were at 4.15pm but we met at 3.30pm and chatted in the relaxation room until our appointments began. Luckily there was nobody else in the room! After our massages, we carried on talking until 7pm before deciding it was time to get ready and go home. I got home, ordered some sushi and got into my pajamas. I was home on Saturday, doing some work and generally lazing around. In the evening, my friend picked me up for our usual walk on the beach. We got there a bit later than usual but still managed to catch a gorgeous sunset! I was home by 7.15pm and had a relaxing evening at home.